Fresh off the BART's twitter, they are going to start on Monday, August 3rd: TRANSLINK. A just recently posted news release from BART tells people that you can start using your Translink cards on BART as soon as Monday. Tomorrow (Sunday), BART is going to update the fare gates to allow usage of Translink cards to the system. It's not 100% ready for the masses, basically it's still "testing." 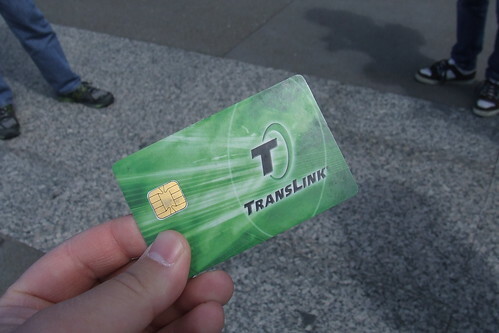 However, it does permit ANYONE with a Translink card to use the system. Their test phase is five months. The three Translink fare payments are accepted: E-cash, Muni adult passes (w/in SF), and an electronic form of BART's high value tickets. Be warned, there are limited places to instantly update your Translink card with more money. Most common places, Bay Area Walgreens. For the high value tickets, you can't claim commuter pre-tax benefits, unless if you get one of those special debit cards from the benefits company. BART doesn't guarantee it will work since it is "testing," so bring some cash with you just in case it fails (like... badly). Whoohoo! Pressure from the public and bloggers like SFist, SF Appeal, Eye on Blogs, and others have forced BART to start playing along with Translink. As for BART board member James Fang... he's probably crying in agony. UPDATE: To get high value tickets, you must be registered for "autoload" with Translink. Since Translink's policy is to not allow commuter benefit debit cards for automatic loading, you should stick with e-cash. Akit, thanks for your continued watchdogging of Translink, especially vis a vis BART! I can't wait for BART to upgrade TVMs so they can dispense and add value to Translink cards (including by transferring paper ticket value). I just Friday bought a $64 ticket from a sales outlet (after going to two others that were completely sold out of BART cards). $64 is a lot of backup to have now that I plan to use Translink! Of course, gawd knows what bugs will ensue, or what lies ahead after the trial period ends. Still, it's exciting times indeed. This is a big step for the "one card Bay Area" to have BART join in. Now you can get anywhere within San Francisco, East Bay, and Marin County on one little green card. PS: I intentionally left out San Mateo County because BART has low ridership in that area. Akit - I've been loading my translink with my wageworks card for autoload for months. Am I about to get some nasty surprise? murphstahoe: I think they discourage that because if you accidentally dip below your card's limit, it might put a hold on your Translink account. I believe as long as you don't tell Translink that it's a wageworks card and just present it as a credit card, I think they could care less. got it. I have 100's on my wageworkds card as my Caltrain Pass costs 159 and now we get to sock away 230 monthly. I probably use 20-30 a month on MUNI/BART/GG Transit. Even holding a balance on that thing, the tax impact means a good return on the money whenever I do need to use it.